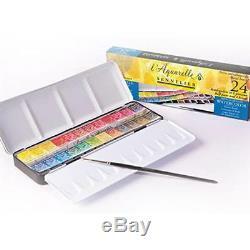 PRODUCT : SENNELIER L'AQUARELLE ARTISTS WATERCOLOUR - 24 HALF PAN - METAL BOX. DESCRIPTION : The ideal set for exploring Sennelier l'Aquarelle watercolours. This 24 half pan set gives you the perfect introduction to the newly reworked formula, giving radiance, luminosity and even creamier consistency to this high quality colour. Set includes a Sennelier water colour brush. Colours included : Lemon Yellow, Indian Yellow, Naples Yellow Deep, French Vermilion, Bright Red, Venetian Red, Alizarin Crimson, Carmine, Quinacridone Red, Opera Rose, Cobalt Violet Light Hue, Dioxazine Purple, Ultramarine Deep, Phthalocyanine Blue, Cinereous Blue, Forest Green, Emerald Green, Phthalo Green Light, Yellow Ochre, Burnt Sienna, Payne's Grey, Warm Sepia, Raw Umber & Ivory Black. The item "Sennelier L'Aquarelle Artists Watercolour 24 Half Pan Metal Box Set" is in sale since Tuesday, November 01, 2016. This item is in the category "Crafts\Art Supplies\Painting Supplies\Paint\Watercolour Paint". The seller is "bargainartistshop" and is located in Stafford, Staffordshire. This item can be shipped worldwide.